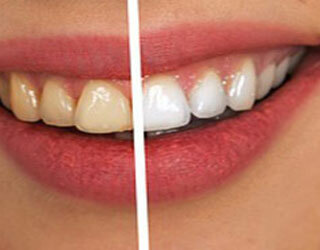 Dental whitening lightens teeth and helps remove stains and discoloration while giving a younger appearance. Whitening is among the most popular cosmetic dental procedures because it can greatly improve how your teeth look. External whitening lightens teeth that are discolored or stained. Our custom bleaching trays are made exclusively for you here in our office. Internal whitening is indicated when a tooth is discolored internally, typically from an older root canal. This quick procedure is performed in-office without the use of anesthetic. Whitening is not a one-time procedure. It will need to be repeated from time to time if you want to maintain the brighter color. We also offer pre-filled trays for your convenience.